Clarets boss Sean Dyche is confident captain Tom Heaton will be fit to face Southampton at St Mary’s on Sunday (kick-off 4 p.m.). Heaton withdrew from England duty on Sunday night with a “minor injury”, revealed to be a calf issue. But it was more of a precaution, and, after checking back in at Gawthorpe, Dyche expects he will be able to extend his record of starting every league game since arriving on a free transfer from Bristol City in the summer of 2013 - a run of 137 games. Meanwhile, Barnes, although not yet considered for a first team return, is making strides after being out since suffering the injury just before half-time in Burnley’s third pre-season friendly at Bradford City. He explained: “Barnesy is back on the grass with us, training actively rather than with the sports scientists. “He’s still not ready just yet but is showing good signs. “It seems to have totally subsided now - it just wouldn’t settle. 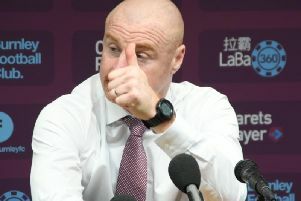 Otherwise, Dyche has no other injury worries, with his internationals reporting back fit, though Steven Defour will only report back today after playing 90 minutes for Belgium in Gibraltar on Monday night. Dyche, meanwhile, hopes to build on the performances against Watford and Arsenal against the third-meanest defence in the Premier League: “Southampton are a very good side, they’ve had a change of manager but are keeping clean sheets and have good players. “We have to be intent on doing what we do and have belief in what we do and so far we’ve had a solid start.